The future of one of Edinburgh’s elegant Victorian listed townhouses has been secured after CSPM, the property management arm of Consensus Capital, reclaimed it from commercial use to develop it as family homes in a sympathetic restoration. The Edinburgh listed building residential restoration is situated in Chester Street in the city’s highly-regarded West End conservation area and World Heritage Site. Charlotte Square Property Management (aka CSPM) recognised the opportunity to turn it from offices back into residential. See the finished results here. The purchase of the iconic A-listed building for residential use is the latest in the city’s boom in converting offices back into residential dwellings. CSPM has led the trend and recently completed two projects on a similar new town terraces in Chester Street. 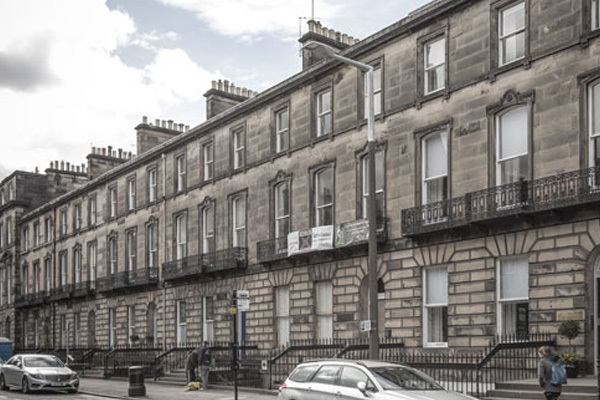 Similar properties have gone through a phase of commercial use for decades, providing large city centre office spaces but this project sees the restoration of one of Edinburgh’s finest townhouses, to provide a family home in the heart of the capital. Historically the townhouses were built to house several generations of family, along with domestic workers and most are too large for today’s requirements. Although with the rising need for family homes across UK, this conversion seems timely. The plans involve creating a Garden flat in the basement and a family townhouse across the three upper floors. CSPM specialises in sensitively splitting off extra space to allow for the creation of a range of properties, from the traditional to the unique. The developer’s first project in Chester Street refurbished and converted former DTZ offices. The latest property to be purchased was previously occupied by the Marine Conservation Society and the surveyors Wren and Bell. CSPM has creating a two-bed, two-bathroom lower-ground apartment and a four-bed townhouse with garden on the site.